I just saw namemasher.com mentioned on programmable web. It's a first step towards addressing one of humankind's biggest challenges: forget about running out of IP addresses, we're going to run out of usernames first! What kind of handle do you think your children be able to get on Friendfeed? Under what name will your grandchildren be able to tweet? And do you think they stand a chance of getting the same nick across all their services? There's a mad stampede for names going on, and any self-respecting parent (or prospective parent) who wants to bring up their children right ought to be out there buying up their progeny's place in cyberspace. Along with the tuition fund you need: website domain name, email account, twitter handle, skype, tumblr ... who knows which will survive, so get them all. You never know: what if you kid gets famous, or even goes into politics? It wouldn't be very presidential if they tweeted as @spaceycasey123456. Parents need something more than namemasher. 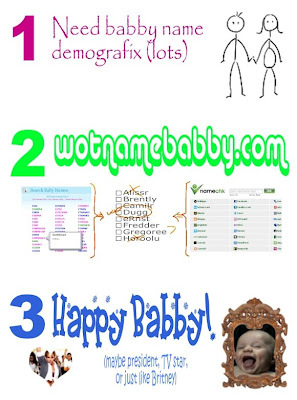 In addition to the parents' names, it needs to munge in family and cultural background, existing baby name references like babynames.com (that's the one with the helpful definition of Espn), cross-check against existing accounts with something like namechk.com, and then go out and pre-register all the services for your unborn child. What an 18th birthday present that would make!